Last summer, eight debut novelists gathered for 30 minutes in the virtual, electronic community of Twitter to compare first-time experiences, discuss the thrill of (finally!) being a published author, and exchange ideas about how to shift from creator to marketer in order to find an audience for our small, independently published books. 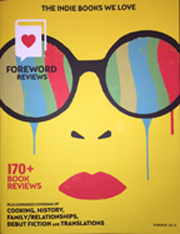 Geographically far-flung and working in a number of genres, we were brought together by a feature article about our eight books in the Summer 2015 issue of Foreword Reviews magazine, a well-respected quarterly periodical and website that focuses entirely on reviewing work published by independent presses—that is, anything not from an imprint of The Big Five publishing conglomerates. After I read the other novels, it was clear to me that, while these folks might be debut novelists, they are fully mature writers. Their books might be from small presses, but there is nothing amateurish about them. That concept is exactly what Foreword Reviews celebrates. Now, two novels from our “Foreword Eight” are finalists for Foreword Reviews’s INDIEFAB Book of the Year Award for Literary Fiction: A Theory of Expanded Love and Even in Darkness. What better way to celebrate what’s best in the vibrant voices of today’s independent publishing than to spotlight these two books? 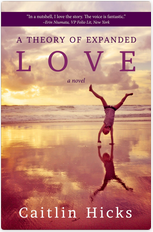 A THEORY OF EXPANDED LOVE, Caitlin Hicks, Light Messages, 2015, 351 pp. Raised to be unquestioningly obedient, she finds she has endless questions and few answers, especially when she discovers a picture of her mother in a wedding gown standing next to a man who is not her father, or when her eldest sister is mysteriously sent away on a “retreat”. Increasingly, she finds that doing what she knows is right puts her at odds with the rest of the family and locks her in a battle of wills with the Ultimate Authority—her father. Caitlin Hicks’ debut novel is both hilarious and moving, thoroughly charming but shot through with serious themes that sneak in while you’re busy laughing. Her writing puts you in the middle of the fractious household, and you needn’t come from a large family to feel what it’s like to be part of the fray. What’s most impressive about Theory is how Hicks has so masterfully pulled off the delicate balance of Annie’s voice, which demands that Hicks maintain a mix of unselfconscious/very self-conscious, naïve, pre-teen self-narrative while still allowing Annie to make some pretty mature observations, and having the whole thing be believable. It works. 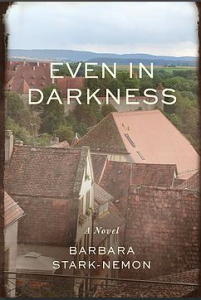 EVEN IN DARKNESS, Barbara Stark-Nemon, She Writes Press, 2015, 314 pp. This story, by turns scalding and healing, traces the life of Kläre Ente Kohler and her family against the slow burn of anti-Semitism from before the Great War, through decades into the all-consuming conflagration of Nazism and the Holocaust, and beyond. The story is told without melodrama; its simple, straightforward language only adds to the force of its impact. Even in Darkness proceeds chronologically but not consecutively. The first chapter starts in 1913 with 18-year-old Kläre considering the marriage proposal from her family’s much older, reserved lawyer Jakob, as talk of war swirls everywhere. The next chapter leaps to Kläre as a married mother of two in 1923, whose husband is becoming increasingly ill and frail from the gas poisoning he suffered during the war. With sure-handed strokes, Stark-Nemon paints an ever-darkening landscape of what it meant to be Jewish in Germany during the rise of the Nazis, in which the gradual, insidious peeling away of the rights of Jews continued over decades until Jews were no longer considered citizens and had no legal standing. Kläre is desperate to leave, but Jakob insists the insanity will pass. When he finally agrees to leave in 1938, he is too ill to be granted a visa. Kläre is left with no choice but to find ways to get their two young sons out of the country, but she stays behind with her mother and Jakob to face the nightmare their lives become. It’s a chilling portrait. At the same time, though, the author illustrates the healing, redemptive power of simply humanity, of how Kläre never abandons her moral center and her innate desire to help those around her. There is something comforting in learning that this story is based on real people in the author’s family, and to imagine that they did, in the end, find that measure of healing. Jenny Yacovissi grew up in Bethesda, Maryland, just a bit farther up the hill from Washington, D.C. Her debut novel Up the Hill to Home is a fictionalized account of her mother’s family in Washington from the Civil War to the Great Depression. In addition to writing historical and contemporary literary fiction, Jenny reviews regularly for the Washington Independent Review of Books and the Historical Novel Society. She belongs to the National Book Critic’s Circle and PEN/America. She also owns a small project management and engineering consulting firm, and enjoys gardening and being on the water. Jenny lives with her husband Jim in Crownsville, Maryland. To learn more about the families in Up the Hill to Home and see photos and artifacts from their lives, visit http://www.jbyacovissi.com/about-the-book.